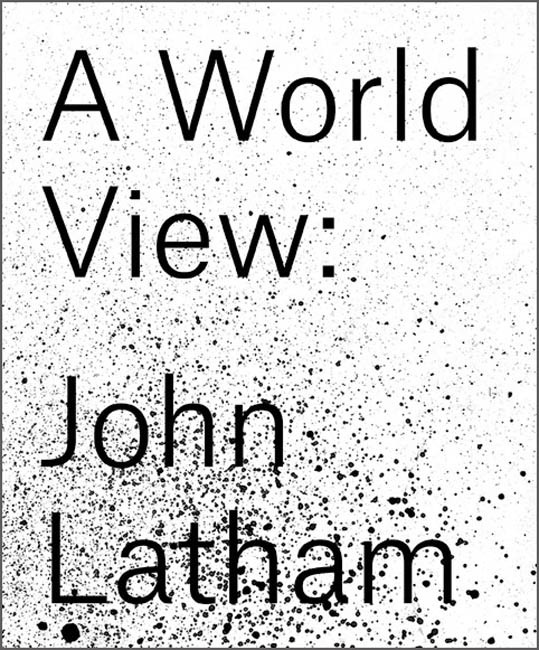 John Latham, John Latham: A World View, Ed. by Amira Gad, Joseph Constable. Foreword by Hans Ulrich Obrist, Yana Peel. Text by Rita Donagh, Amira Gad, Richard Hamilton, Katherine Jackson, Elisa Kay, Adam Kleinman, Noa Latham, David Toop, Barbara Steveni, Cally Spooner. Koenig Books, 2017. This volume is published on the occasion of the Serpentine Galleries Spring Season (2 March–21 May 2017): A World View: John Latham at the Serpentine Gallery and Speak: Tania Bruguera, Douglas Gordon, Laure Prouvost, Cally Spooner at the Serpentine Sackler Gallery. John Latham is widely considered a pioneer of British conceptual art. His multifaceted practice encompasses sculpture, installation, painting, ﬁlm, land art, engineering, found-object, assemblage, performance happenings and theoretical writings, the diversity of which is galvanised by his unique understanding of our place in the universe. The group exhibition Speak, running concurrently at the Serpentine Sackler Gallery, proposes Latham as an ‘open toolbox’ for younger generations of artists whose diverse practices share affinities with Latham’s ideas and world view, revealing how they continue to resonate today. This publication traces the trajectory of Latham’s practice and brings together archival material, including documentary photographs, texts, correspondences and various ephemera, in order to build a picture of the artist’s life and work. The book begins with two texts by Richard Hamilton, which draw upon his personal experience of working with Latham. Elisa Kay, previous director and curator at Flat Time House, focuses on Latham’s Roller Painting, THE, as well as expanding on the role that this space played within Latham’s practice. Noa Latham focuses on the monumental work, The Story of the RIO, and Katherine Jackson provides an in-depth analysis of Latham’s APG placement at the Scottish Office. David Toop’s text ‘Blow Up’ draws upon ideas of sound, silence and noise as it relates to Latham’s work, in particular his film works of the early 1960s. Adam Kleinman and Cally Spooner offer contemporary responses to themes including social sculpture, global politics and the production of reality, which resonate with Latham’s understanding of time and history. To close the publication, Serpentine Galleries curator, Amira Gad’s essay provides a historical overview of Latham’s practice. The volume includes a selection of interviews conducted by Hans Ulrich Obrist with John Latham, Barbara Steveni and Douglas Gordon, and between Anish Kapoor and Latham, which draw out the conversations that have informed this project. The book also contains a series of visual contributions and interventions by Tania Bruguera, Rita Donagh, Liam Gillick, Douglas Gordon, Yoko Ono, Laure Prouvost, Pedro Reyes and Barbara Steveni. John Latham (1921–2006) is widely considered one of the pioneers of British conceptual art. His work encompassed sculpture, installation, painting, film, land art, engineering, assemblage, performances and happenings and theoretical writings; he is probably most famous for his burning book towers (“skoobs”) and his light-show collaborations with Pink Floyd. The incredible diversity of Latham’s work was part of a lifelong quest to understand our place in the universe. The first comprehensive volume on this cult artist, John Latham: A World View traces the trajectory of Latham’s practice and brings together archival material, including documentary photographs, texts, correspondence and various ephemera, in order to build a picture of the artist’s life and work. The public life of the artist John Latham was rounded with controversy. He died aged 84 accusing the Tate of suppressing his work in the John Latham in focus exhibition at Tate Britain, running until the end of February. Back in the 1960s he had invited his students to join him in a feast where the main course was to be Clement Greenberg's book Art and Culture, a volume of art theory. This, they chewed up and spat out for Latham to bottle, distil, decant into a phial and put into a leather case to be displayed as a work entitled Spit and Chew: Art and Culture and now owned, but rarely displayed, by the Museum of Modern Art in New York. Latham's lurid career featured more prominently in press reports than it did in 20th century cultural histories. However, he was a prime source of conceptual art, a fact acknowledged by Tate Britain's director, Stephen Deuchar. It was Deuchar, though, who was attacked by Latham for the withdrawal of his work, God is Great, from the current show, without consulting the artist. The work consists of copies of the Bible, the Talmud and the Qur'an embedded in a six foot sheet of glass, and embodies, Latham said, the different belief systems springing from a single source of enlightenment. Following the withdrawal, the media was alerted to another breach of freedom of expression. But a minority of commentators argued that, in the wake of fatwa against Salman Rushdie following publication in 1988 of The Satanic Verses and the July 7 bombings last year, it was easier to prescribe courage when away from the firing line than to exercise it when in a target area involving the public. Latham was born in Livingstone, Northern Rhodesia (now Maramba, Zambia) of English parents and was educated at Winchester. During the war he served with the Royal Naval Volunteer Reserve, and commanded a motor torpedo boat. In 1946 he studied art at Regent Street Polytechnic and then Chelsea College of Art and Design. His earliest existing work in the Tate collection, Man Caught Up with a Yellow Object, is an oil of 1954, the year of his first solo exhibition, at the Obelisk Gallery in London. It shows a Christ-like figure against a swirling background, a powerful image that suggested an artist more interested in the process of making art than in the finished work. Latham used a spray gun to disperse tiny dots of black paint across the surface. He claimed to be the first to do this, though it became a very popular device. Latham himself used the spray gun for a series of 60 "one-second drawings" which denoted "the least event"; an illustration of Latham's view that time consisted of a series of events, and each of the carefully annotated and recorded one-second drawings was, as it were, an exhibit in the courtroom of eternity of time transfixed on the wing, the equivalent of the world in a grain of sand in the words of William Blake, the visionary with whom Latham was sometimes compared. If some of this looked philosophically and artistically dubious, his "skoob" (books backward) works added shock value. He first worked with books in a work based on El Greco's Toledo masterpiece The Burial of Count Orgaz, which depicts the armoured Spanish nobleman slain on the field of battle and then translated in naked glory to the feet of Christ and the Virgin. In the Latham version, the heavenly host is mostly represented by collaged books. From this Latham moved on to constructing towers from volumes of Encyclopedia Britannica and torching them. Books are only objects, but they embody the idea of civilisation and the enlightenment, and burning them had deep and fearful resonances in the post-Nazi period. Latham saw books as the source of knowledge but also of error, and moved on, undeterred, in 1966 to Greenberg's treatise, Art and Culture. The students who helped in its regurgitation were at St Martin's School of Art, where Latham held a part-time teaching post - from which he was fired for failing to return the book to the library in a readable form. This was the first of what he saw as his triumphant encounters with authority. With some justice, Latham regarded Greenberg's work as blinkered and propagandist. But ironically Greenberg believed that the execution of the work of art counted for nothing and the concept was all - quite close to Latham's own practice. Creation and destruction, the twin demons driving art, were at the centre of a good deal of practice in the 1970s and 1980s, and Latham was friendly with two famous "deconstructionist" performance artists. These were Gustav Metzger and Yoko Ono, herself a compelling performer who was, of course, rather more famous for the company she kept. In 1951 Latham married Barbara Steveni and together they set up the Artists' Placement Group, an attempt to involve artists in local government and industry. It had little success, but that was not the fault of the artists who found themselves hard pressed to overcome the habits of bureaucracy. He probably felt the same about Tate Britain over the withdrawal of God is Great, a work he had presented to the Tate and which, he said, was integral to John Latham in focus, a survey of his work from 1954 until now. A planned public discussion of his work at the Tate on February 17 will now go ahead without him. After the news of Latham's death Deuchar praised him as "an important and inspirational figure as an artist, teacher and thinker".